In a post-apocalyptic show, it’s important to establish early on just how easy it is for people to die. By definition, the world the show is set in is supposed to be a bleak, dangerous one devoid of all the usual comforts, where you can be killed by something as obviously threatening as a better-armed bandit gang or as subtle as an infected wound. Most shows of this type tend to keep a well-stocked pool of these characters around for just such a purpose, known by such terms as redshirts, cannon fodder, zombie food or simply bait depending on the threats in question. And as viewers, we’re used to seeing them picked off one by one—both because there’s a perverse sense of fun in watching Darwinian logic, and because it raises respect for the core characters who are able to survive it. But of course, the big question is how willing a show is to kill off one of the characters you’d identify as a member of the core group, and how soon the series is willing to do it. In “The Plague Dogs,” Revolution proved that it’s not afraid to pull the trigger on one of its own, and that it’s not afraid to do so comparatively early in its run. It’s a move that not only establishes its bona fides of being a show that’s willing to raise the stakes, but puts another brick in my growing conviction that this is a show that’s increasingly finding its footing. The episode teases death for several of its characters throughout—a potentially rabid dog bite on Aaron’s leg, a deadly crossbow trap leveled at Charlie’s head by the dog’s master—but the unlucky winner of this lottery turns out to be Maggie. 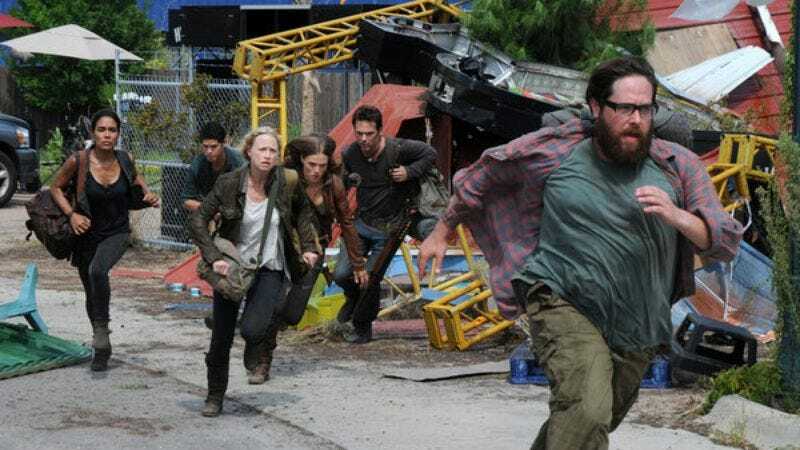 After she and Aaron rejoin the rest of the group at their designated meeting place in Lowell (Aaron convincing her to stay silent about the pendant’s powers), they’re waylaid by a series of obstacles ranging from a looming storm, persistent militia scout Nate and a pack of dogs. While attempting to gain cover, Maggie’s separated from the group, and the master of the hounds takes retribution for the dog she killed by stabbing her in the femoral artery. Going into the episode I don’t know if I would have picked Maggie as the first candidate from the main group to meet a tragic end, but from a narrative standpoint it makes sense. Miles and Charlie are the leads of the show (as annoying as the latter continues to be), Aaron’s the new guardian of the pendant, and Nora has the established connections to Miles and the rebellion. Of the group, she’s the one the show can afford to lose her without getting in the way of the broader story, or the gradual expansion of the show’s post-power universe. I do feel this death came a little too quickly—especially given Maggie and Aaron spent roughly half the series on their own side quest—but in four episodes there’s been enough background in the uneasy relationship between Maggie and Charlie that it remains a death that reverberates through the survivors. And more to the point, it’s a death the show fills with its own import. Unlike the flashbacks of previous weeks that have been about world-building, the flashbacks to Maggie’s earlier life are all about what the blackout cost her, the human element that’s so important to a story like this. There’s a real story being told here with some legitimately compelling moments: her last glimpse of her children on a Skype connection between Seattle and London, traveling to the coast in a desperate effort to book a ship across the Atlantic, and her quiet attempt to commit suicide by a lake before Ben stops her. Her final scene has an almost lovely dreaminess about it, flashbacks of reading The Wizard of Oz to her children cross-cut with her last breaths. We only spent four episodes with this character, but the work done here to establish her life, and the quiet dignity Anna Lise Phillips projects under pressure means she’s one I’m sorry to see go. Maggie’s death aside, “The Plague Dogs” still has the scattered nature seen in the early installments, as the various subplots and relationships established are all spinning their wheels a bit before their inevitable intersection. Miles is clearly still chafing at the reveal of his secret past as militia general and Charlie’s resultant hostility, and has opted to take the blame on himself and run away. Maggie argues that Charlie could help Miles, but she seems to be rubbing off on him in the wrong ways—his gripe “I have no idea why I signed on for this in the first place” feels a lot more like whining than the typical irritation we’ve come to enjoy. The two feel like they’ve been having the same fight for far too long, which makes me hope that Maggie’s death will also provide a new resolve to that relationship and let them both move on. And finally, there’s the return to Rachel and her captivity. They’re still shrouding this plot in mystery, as Rachel’s unwilling to give Monroe any details on what Ben knew and when he knew it, even when Sergeant Strauss brings out his torture kit and apologizes in advance. (Yet bafflingly, she certainly didn’t seem any worse for wear the next day.) This is still a plot point in development, and still one that’s less interesting than the day-to-day survival aspect. More intriguing is the reveal via flashback that her captivity came of her own volition, as she handed herself over to Miles when he was still wearing the militia uniform. Sooner or later, she’s going to meet up with the rest of the cast, and when she does it’s better for them to build the history now rather than unwind it all after the fact. I never thought I’d be saying “The Cape makes an effective archvillain,” but in the brief glimpses we’ve gotten he has been—and that’s just one of the gradually increasing ways Revolution’s managing to surprise me. It’s still going through its growing pains and getting a little bit buried in the amount of information it’s doling, but it’s also proving to be a shrewder show than I predicted it would be at first glance, a rewarding thing to see as its disparate pieces move closer together. And based on the way “The Plague Dogs” shows it’s willing to raise the stakes, it might be worth setting up a death pool about which character goes down next. My prediction from last week came to pass almost as soon as I made it, as NBC ordered a full season worth of Revolution the day after. Some may say this was an easy call to make, but I am going to choose to believe I have psychokinetic powers and willed it into existence. Revolution from RPG perspective: Maggie’s loss to the party means they’re without a healer, as well as coming up short on their Craft Potion checks. Nate’s conscription into their group does give them another archer, but the party’s nowhere near as balanced as it was. There’s been plenty of people griping about how there’s no alternate energy sources post-blackout, but it looks like at one point there was: the fisherman Maggie attempts to book passage with mentions that all the steamboats were broken down for lumber or destroyed by the militia. Little details like that make me want to see more of what’s happened in the fifteen year interval. Several of you pointed out in the comments from last week that the aliases Miles provided to the rebels (“I’m Stu Redmond, and this is Frannie”) were an obvious reference to Stephen King’s The Stand. Having not read The Stand, I did not mention said reference, of which I beg your forgiveness and await your multiple pleas to read it. In cast sightings, Tim Guinee popped up on last night’s Homeland as the CIA’s head of covert operations. Perhaps Ben’s Department of Defense clearance Monroe hints at is just the tip of the iceberg? Unlikely crossover, but I won’t rule out a reveal that Abu Nazir caused the blackout.